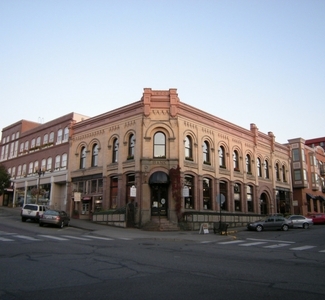 Located on the south side of Bellingham, Fairhaven is noted for its colorful 19th century history, which includes an 1880s developer and ex-rum-runner named “Dirty Dan”. With hopes of being the next Chicago, Fairhaven bustled with hotels, taverns, an opera house, concert garden, restaurants and brothels. The boom in 1890, driven initially by demand for lumber, coal and fish, was further fueled by the rumor that Fairhaven was to become the western terminus of the second northern transcontinental railroad. By 1893, construction abruptly stopped as the railroad came across the mountains farther south. Today, several red brick relics of Fairhaven’s Victorian era survive in the federally designated historic district’s six square-blocks. They (and other structures) are now home to a variety of unique local restaurants, pubs, art galleries, antique shops, bookstores, boutique hotel plus an inn and spa. The district has blossomed into a major destination and residential community. Sidewalk tombstone-style markers and brass plaques on buildings tell tales of Fairhaven’s past.